Andica Payroll Software is an easy to use yet comprehensive payroll solution to calculate Employees and Directors payroll and submission of Real Time Information RTI to HMRC. Software includes calculations for PAYE, National Insurance Contributions, Statutory Payments, Pension contributions, Attachment of Earnings Order, Student Loan, etc and performs a range of other payroll functions. Andica Payroll Software is a powerful and flexible payroll solution with Real Time Information RTI submissions and Automatic Enrolment pension calculations. The payroll software is suitable for most types of employers - small to medium sized businesses or charity organisations and it complies with the latest government legislations outlined in the features section. Andica Payroll Software is designed to be easy to use, it allows payments of salaries and wages and non statutory deductions to be defined by users to suit the business needs while the payroll software takes care of the statutory calculations. Andica Payroll Software provides a range of standard reports such as payslips and payroll analysis. 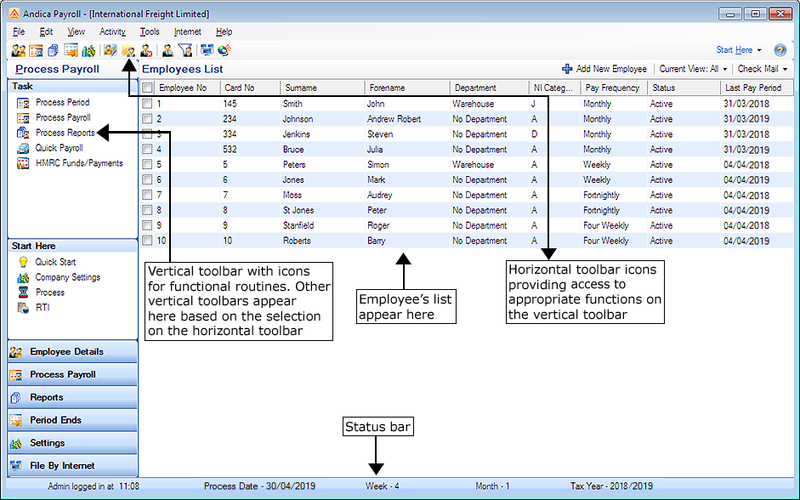 All employee data can be instantly viewed on screen or reproduced in simple, easy-to-follow reports. Management information can be obtained quickly and easily. Processing the payroll can be one of the most time consuming tasks for any company but Andica Payroll software puts you firmly in control. It also comes with many features designed to make the processing of payroll simple, quick and accurate. Andica Payroll software has gone through extensive testing and has been recognised by HMRC for payroll calculations and Real Time Information RTI submissions. HMRC's recognition process helps employers identify payroll software products with the essential features necessary to calculate PAYE, National Insurance Contributions, Statutory Payments such as Statutory Sick Pay SSP, Statutory Maternity Pay SMP, Statutory Paternity Pay SPP, Statutory Adoption Pay SAP, Additional Statutory Paternity Pay ASPP, Shared Parental Pay ShPP, students loan deductions and perform a range of other payroll functions.